Matt Heinz is the founder of Heinz Marketing, a Seattle-based marketing agency focused on sales acceleration. Heinz helps clients achieve sustained sales success by growing revenue from existing customers and cost effectively identifying and winning new customers. 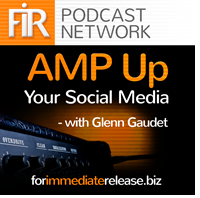 Matt recently joined AMP Up Your Social Media’s host Glenn Gaudet to discuss the need for an integrated sales and marketing approach via social media to increase sales and velocity. Start with content. Understand who your audience is and what they care about. What are the primary problems, trigger events, or buying signals that you can engage someone with with good content that leads them to be interested and learn more about you? Make social media a regular habit for your sales team. Setup a daily reminder for them to network daily. Everyday the marketing team should feed the sales team with content for them to post to their own social channels. Sales people should reply to any comments, and follow all of the people they talked to the day before on Twitter and send them LinkedIn requests. Reuse and repurpose content. There are many tools available to automatically repost previous blog posts so you can reuse content with ease. You can read more from Matt on his blog, Matt on Marketing, or follow him on Twitter. Matt Heinz brings more than 15 years of marketing, business development and sales experience from a variety of organizations, vertical industries and company sizes. His career has focused on delivering measurable results for his employers and clients in the way of greater sales, revenue growth, product success and customer loyalty. Matt has held various positions at companies such as Microsoft, Weber Shandwick, Boeing, The Seattle Mariners, Market Leader and Verdiem. In 2007, Matt began Heinz Marketing to help clients focus their business on market and customer opportunities, then execute a plan to scale revenue and customer growth. Matt lives in Kirkland, Washington with his wife, Beth, three children and a menagerie of animals (a dog, cat, and six chickens).